Biscuit layer is made nutritious by adding ground almonds and flaxseeds. Crush biscuits, almonds, flaxseeds in the food processor to fine powder crumbs. Pour crumbs, olive oil/melted butter into a bowl and stir until fully combined. Pour into greased and lined casserole/baking try and press into even layer. Bake for 10-12minutes/ until light brown in the pre-heated oven at 180deg C.
Spoon about 2 tbsp of biscuit crumble into individual serving dishes. Use a small glass to press the crumbs into a firm layer. Top it with fruits of your choice. Repeat 2-3layers as per the serving glass size and finally top it with tutti fruit and crushed nuts. Home made Jelly is added to make this desert Kids treat. On a friendship day I would like to dedicate this Vegan dessert my friend Charanya @ Yes I am Vegan, who influenced me to explore Vegan recipes. Posted on August 3, 2014, in Dessert, Indian, International, Kids recipes, Sweets, Vegan and tagged Biscuits and nuts crumble, Biscuits nuts and fruits crumble, Chitras healthy kitchen, drchdietfood, Kids treat dessert, Vegan dessert recipes. Bookmark the permalink. 62 Comments. Thanx for your lovely compliment dear Suzanne. ..your so sweet and encouraging. it means a lot to me…have a lovely day…. Wow … I salivated looking at the picture! Charu – You inspired me for Vegan recipes. On this special day of Friendship have dedicated this recipe to you. 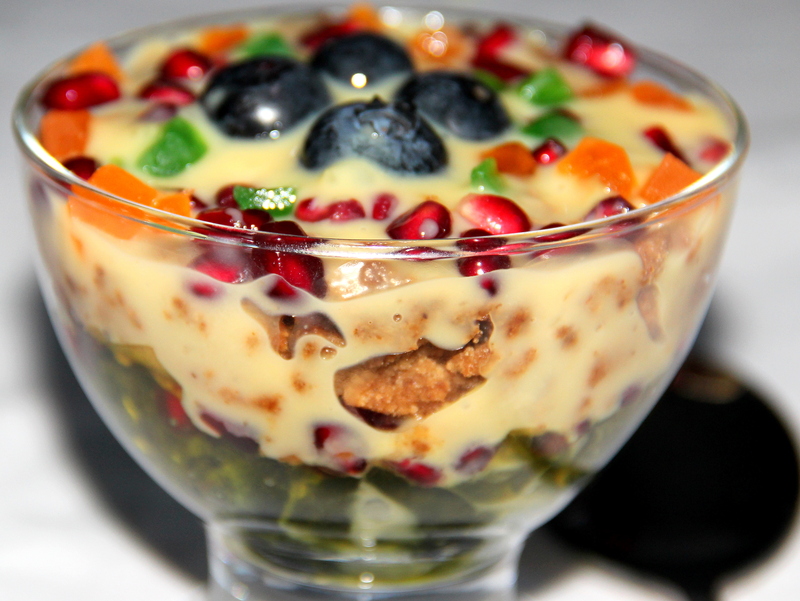 Chitra….the pudding looks so colourful n super delicious!!! A yummy treat, especially in summer with all the fresh fruits. That custard looks SO YUMMY! I love custard and fruit. But one of my passions is medieval based food where the custard was not sweet but rather savory. SO I also love turnip custard pie with sauteed onions. To the modern person, custard should be sweet so that combination would be nasty, but to the medieval where it was more of a fluffy quiche, it was a wonderful staple 🙂 Keep the custards coming! Thanx Julie for your visit and valuable feedback. ..